If you're a customer using a previous version of our ledger application, you should give us a call. Multiple years -- No need to close one year before proceeding to the next. No uploading -- Posts application-generated entries directly into a current period. Add accounts and report lines at the same time. Aids for finding posting errors. Note: The screen shots on this page are from our software as used by real customers with, of course, customer-specific information blurred out. You can click on each image for a full-sized version. 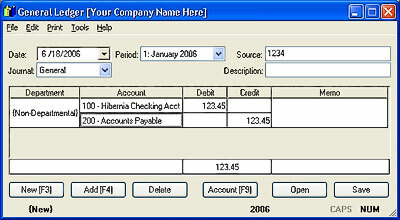 Click here for a diagram showing how this application connects with our other sales and financial-accounting software. 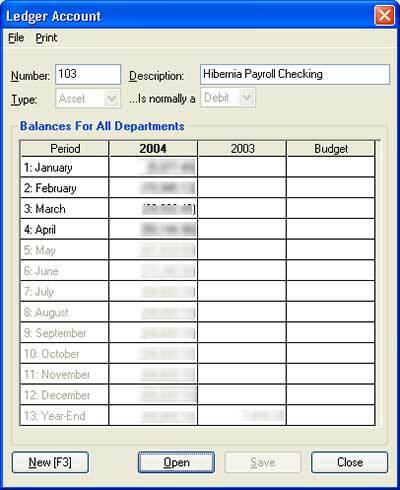 A double-entry general ledger for users with little background in accounting, based on a single window for entering balanced Journal Entries and a very simple visual method for creating custom financial reports. Puts functional general-ledger accounting in businesses who never thought they could. Then, we show them how to build their database, including formatting their primary reports, and we help them configure their other applications to create the relevant transactions. Finally, we help them set up routines by which most of the ledger work is done automatically by the various applications, and we show them how to enter some recurring periodic work directly into the general-ledger application. They key here is that the overwhelming volume of this work becomes a by-product of our customers' regular routines. They can create meaningful up-to-the-minute reports at any time and turn over complete detailed information to their accountants. Actually, our experience is that accounting professionals love this, because it saves them a lot of scut work they hate, and they can focus on the analysis and advisory services that are their primary products. Note: This application does not normally take the place of professional accounting for a business. It just brings the day-to-day work "in-house" for timely and cost-effective reporting. We do not provide consulting on accounting beyond support for our applications themselves. However, we do connect your accountant's guidelines with your daily routines. The application launches directly into a window for entering and editing Journal Entries. The grid in the middle of the window breaks the Journal Entry into debit and credit amounts. It shows subtotals, and will not allow you to mistakenly save an out-of-balance Entry. At any time, you can press F9 and review the current balances for an account. This one window shows all the periodic balances -- for the current and previous years and budgets. It initially shows the totals for all departments, but you can select individual ones, and your can review balances for other years. You can create your own Balance Sheets and Income Statements by connecting one or more account balances with descriptions, including subtotaling, like this. This is one of the real strengths of this application! You just define each report line, its description, which account balances you want to sum and the columns in which you want to print that -- all however you want it. 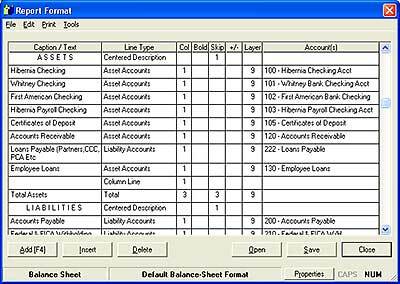 We use a familiar Windows "wizard" routine for adding new general-ledger accounts. This makes initially building your Chart of Accounts and adding accounts down the road -- and accurately typing the new accounts to report formatting -- a snap! 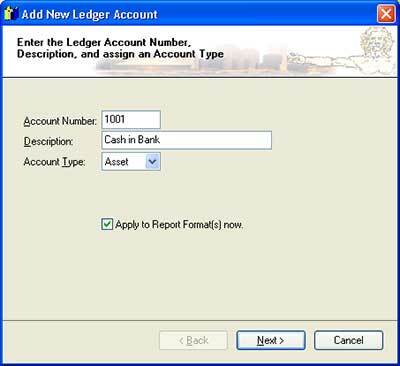 Click here for more on the wizard for adding new general-ledger accounts. We are constanatly adding utility routines that pour through the database and find anomalies. These help eliminate the "needle-in-a-haystack" nature of accounting problems. These are just some highlights. There's much more to this application. Please give us a call, and we can review the details.